With all the *insert business jargon here* finalised between Sony and Disney, Spider-Man has finally found his place in the forever expanding MCU and made a widely appreciated debut in last year's blockbuster Captain America: Civil War. Now, in arguably one of the franchises most anticipated films to date, the web head returns for his second reboot and what's arguably gonna be one of his most successful films yet: Spider-Man: Homecoming. Peter Parker (Tom Holland) struggles to balance his school life with the superhero prospects he so desires, following the evolution of his unique powers as well as his brief but influential role within the Avengers and their recent conflicts. 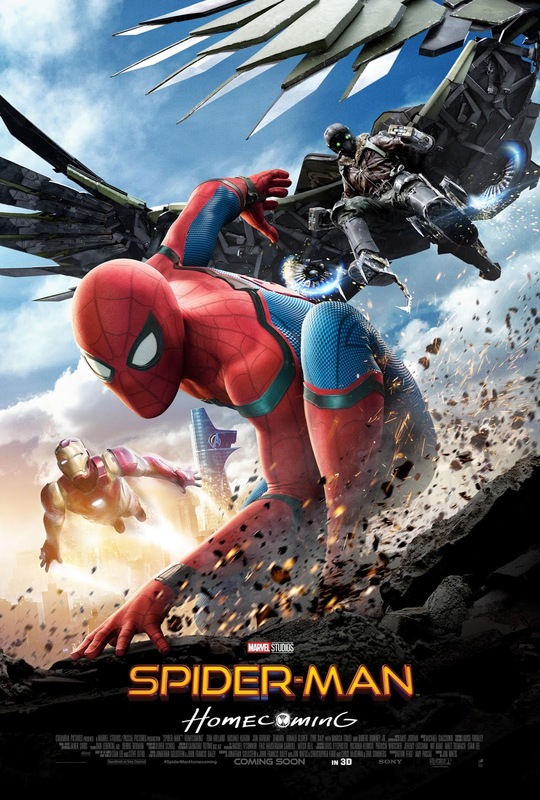 Aided by the influence of his idol Tony Stark (Robert Downey Jr.), his understanding of his responsibilities develops as his conflicts continue, which soon brings him to his most dangerous foe yet - Adrian Toomes (Michael Keaton), whose undercover plans seek to challenge the very thing the Avengers stand for. Obviously we've all wanted to see Spidey spin his way into the MCU, but what we don't wanna see is yet another origin story; and Homecoming thankfully acknowledges this. We're not treated to another close up spider bite, another rewording of Uncle Ben's most iconic line, and of course not another take on his tragic death sequence. Here, following on from Civil War, all of the continuity is established, with any important details briefly yet effectively explored without rehashing what we've seen many times before. With that said, the filmmakers haven't forgotten that we're still in Spidey's early days - and so the character's blatant lack of experience and believable reactions to the many dangers he faces add a surprising layer of depth and introduce some interesting themes of...uh...well, great power and great responsibility. This is all helmed by a fantastic performance by Tom Holland himself - I won't claim to be the biggest fan of Civil War and Spidey's role in the film felt forced, obnoxious, and just downright irritating. But here, while Holland may be excessively "colourful" at times, his talent is still clearly visible from beginning to end; with him effortlessly capturing the cocky albeit genuinely heroic persona behind the mask yet also the vulnerable nature of Peter himself. What also works surprisingly well is Stark's role; Marvel's marketing efforts almost made Homecoming feel like some sort of awkward Spidey/Iron Man crossover, but this is thankfully not the case. Stark mixes into the story well as a likeable and meaningful icon to direct Peter and his choices as a hero, making him genuine and interesting for the most part, and not just a forced integration of arguably the MCU's most profitable character. Whilst Homecoming masters a lot of the most important factors, it isn't without fault - such fault mainly stems from a script that adopts an occasionally hit and miss sense of humour and a foe who is somewhat disappointing in the long run. As a villain, Vulture rings with potential and promise, thanks to a design that is both loyal to the original and fresh in it's own right and a strong performance by Keaton. He is intimidating yet lifelike, and always entertaining to watch, though it's a shame that his sporadic screentime and lack of depth restrict a lot of said potential from truly coming to fruition. What's more is that as we near the conclusion, more twists come into play. The problem? Their overall influence on the narrative is almost non existent, making them feel like cheap and disappointing attempts at generating some quick wow factor above anything else. Sounding annoyingly negative is one of my key traits - but there is still much to enjoy in Spider-Man's latest return to the big screen, and most MCU fans are sure to have their hype rewarded. This exciting blockbuster does a largely successful job at balancing an interesting story with a welcome sense of fun and some gripping action sequences, brought to life by some superb special effects - sadly, this also makes it all the more frustrating when the some of the characters and themes it develops are just not given the consistent level of focus they require. Regardless, it's a big step forward from the mixed Amazing series, and a strong start for the web head in this ever expanding franchise.